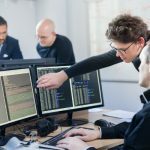 The DevOps paradigm for software development, which combines new strategies for managing technology, processes, and teams to produce software on a more or less continuous basis, is made possible through the extensive use of virtualization technologies. Virtualization affects every aspect of DevOps from development, test, and deployment to operations and maintenance. For this reason, it is critical to have a good virtualization strategy and toolchain when shifting to the industry’s most cutting-edge software engineering approach. One-way virtualization helps DevOps teams deploy code quickly and correctly is by providing a consistent, stable environment for development and testing. The behavior of virtual machines, which abstract the underlying hardware, is often more predictable than programming on “bare metal,” especially at scale, because real hardware can often exhibit slight differences due to manufacturing processes, part substitution, firmware differences, or intermittent failures. With virtual machines, the system’s configuration, device functioning, and even memory state are highly predictable, meaning software is subject to fewer latent defects, and those that do exist are much more reproducible. In addition, most DevOps environments use the same virtualization for both development and production systems, reducing the likelihood that configuration errors arise during the transition from development to deployment. Virtualization also helps teams catch errors faster and reduces check-in and release failure rates significantly. That’s because when software is developed in a virtual environment, it’s easy to deploy for extensive functional, regression, performance, and compliance testing via a “virtual” test rig. DevOps teams often design elaborate automated testing schemes to simulate the use of the software under real world load and failure conditions. These tests are configured to run automatically each time a developer submits code for check-in, meaning bugs that might otherwise be discovered only after a release, are found immediately. The use of large-scale virtualization (i.e. “spin up” of multiple servers) also allows for simultaneous testing on different release and patch levels, as well as integration with other software systems creating a complete virtualized system that dramatically improves product compatibility and interoperability. Post-deployment reliability and maintenance costs are also improved by virtualization. The pure ‘Ops’ part of DevOps can benefit from standardization of hardware and software environments across applications and releases, reducing the investment in maintaining custom configurations for each. When hardware fails, many virtual environments can also facilitate transfer of processing to backup systems, as well as scale to meet increasing performance demands. Finally, by providing a consistent, predictable, and failure-tolerant environment, DevOps virtualization can improve the performance of software in situations where configuration control, safety assurance, or cybersecurity are critical. Virtual machines offer a range of stakeholders including product teams, security architects, certifiers, and accreditors, the opportunity to evaluate system performance in a well-defined, predictable, and repeatable fashion. High-risk tasks can also be carried out in isolated virtual containers separate from other processes and data, further mitigating safety and security risk. Until now, virtualization has largely been a phenomenon of desktop and enterprise software applications, but the emergence of virtual platforms for a wide array of hardware paradigms including mobile, embedded, and internet-of-things technologies will ensure that DevOps will continue to grow in adoption in these fields in the years to come. To develop a virtualization strategy or to learn more about the positive benefits for your project, contact Performance Software to get started.